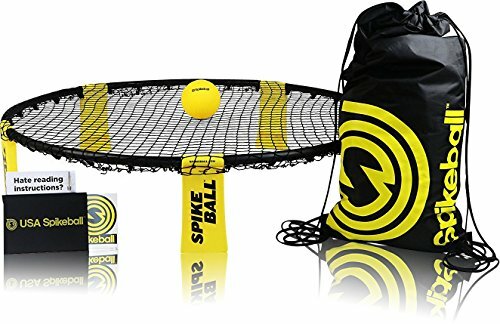 As Seen On Shark Tank TV This version of Spikeball comes with 4 balls. Spikeball is an intense new game that is played 2 on 2. It's sort of a funky combo of four square and volleyball. A taut Hula Hoop-sized net is placed at ankle level between a pair of two-player teams. You smack the palm-sized ball down on the net so it ricochets up at your opponents. They have up to three hits between them (just like volleyball) to control it and bounce it back to you. When they miss, you score. First team to 21 wins. Great for athletes cross training for Lacrosse, Tennis, Ultimate Frisbee, and for athletes who do Crossfit. Spikeball is a great outdoor, indoor, backyard, camping, beach ball lawn yard toss family game for adults, and kids. All Spikeball sets come with a LIFETIME MANUFACTURER'S WARRANTY. Purchase directly from Spikeball and we'll replace any broken part, free of charge, forever :) This warranty is not transferable. If you have any questions about this product by Spikeball, contact us by completing and submitting the form below. If you are looking for a specif part number, please include it with your message.